Christmas Ornaments Made in USA - Flame Red Glass Ornament Balls - Set of 4 - A Christmas Ornament Co.
Made in America. The modern-day Christmas ornament came to be in the middle ages, when Venetian traders brought the 4000 year old art of mouth blowing delicate art glass to the northern village of Lauscha, Germany. Master artisans created beautiful glass ornaments to the villagers' homes and Christmas trees. "There was every kind of gilt hanging-thing, from gilt pea-pods to butterflies on springs. There were shining flags and lanterns, and bird-cages, and nests with birds sitting on them, baskets of fruit, gilt apples, and bunches of grapes." Childhood memories abound with these glass ornaments, which were around many years before the advent of plastic Christmas balls. Many of us can remember sitting by the fireplace as children as mom and dad decorated the Christmas tree with all manner of baubles, decorations, ornaments, lights, a tree-topper ... these are the things very special childhood memories are made of, and these ornaments are a return to a simpler and happier time. We are pleased to offer these antique-style delicate glass ornaments in a variety of sizes, decorative designs, and colors - each has a hand-finished exterior and a silvered interior - the process that dates back over 160 years. 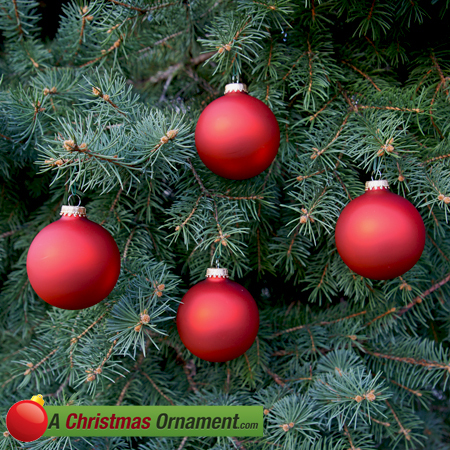 These ornaments can be used as tree ornaments or Christmas decorations and can be hung from just about anywhere due to their light weight, however, they are not toys and small children should not be allowed to play with them due to their delicate nature.